Christian Gerald M. Esteban from Darien, IL, USA is a 5th grade student. 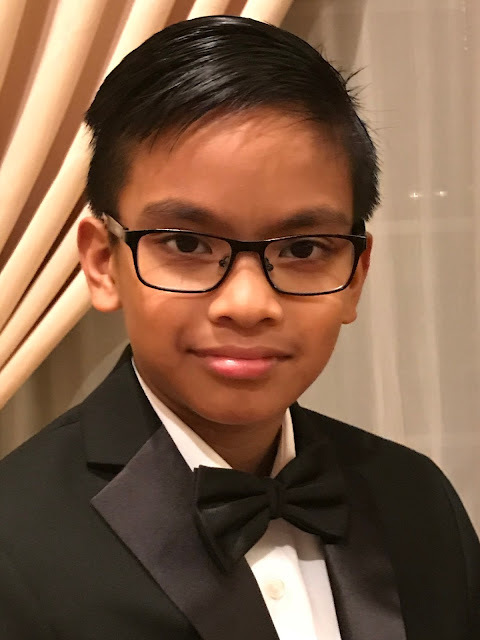 He made his Carnegie Hall debut this April 2018 for having won first place in piano at the American Protégé International Music Talent Competition. His music journey started with formal piano and keyboard lessons at age of five under Lori Graves with vocal lessons on the side. Currently, he studies piano under Sueanne Metz. From age five thru seven, he won the Age Champion title for piano at the American Guild of Music (AGM) national competition then Age Champion for Vocals on Broadway category when he was 8 years old. At six, he garnered the All-Around Keyboard champion title at the AGM nationals held in Louisville, KY. He won first place in piano at the Illinois Music Association (IMA) state competition performing on senior level at the age of 8. He also studies violin with Edward Kreitman at the Naperville Suzuki School. His love for music branches out from formal competitions to the local community where he serves playing music for Sunday church mass. For him, music is a gift he will always be grateful for- one that is willingly given and willingly shared.